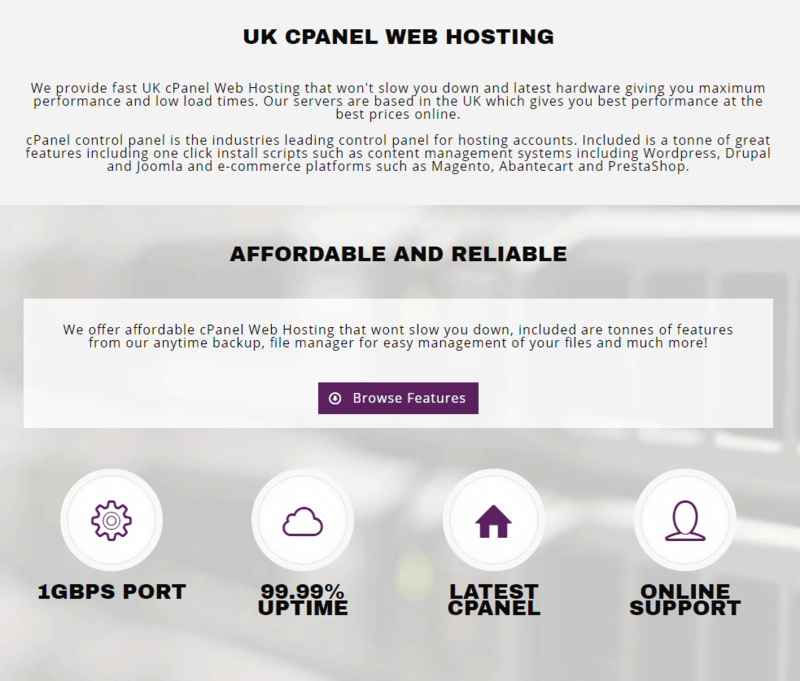 Web Hosting UK Review 2019: Is Web Hosting UK a Good Hosting? Web Hosting UK offers the ease in website making that every website owner wants. Website builder, software installer, easy backups, and e-commerce services are some of the features you’d love. Web Hosting UK was established in 2012 and is based in London, U.K. with their data center located in the same city as well. Their customers vary from casual one-page site owners to small and medium businesses. They currently host over 500 websites on their servers. Web Hosting UK is a good option for non-technical people who want to stay away from coding for their website. This is evident not only from the availability of a WordPress hosting option but also from the free website builder available in the cPanel. On top of that, they offer Web Design services using WordPress where they make the website according to your needs. The advantage of this package is that while you do pay for the website building process, you don’t have to pay for the hosting and the domain for the first year! And what’s more, they even have a dedicated service for e-commerce, helping you create your online store in a professional manner. As the name suggests, their data centers are located in the U.K. and are powered by the Linux operating system. Unfortunately, there aren’t any Windows-based accounts available. They also use fast SSD storage which offers approximately eight times faster data transfer compared to SATA drives, giving you a great advantage when it comes to page loading speeds (and therefore search engine rankings). Thanks to their magnificent uptime and security features like SSH Access, IP Blocker, Hotlink and Leech Protection, etc., you can create a safe browsing environment for your website visitors. Backups are easy to create through the cPanel, which will be really useful in protecting your own progress on your website. Free SSL certificates round up the security features and ensure everyone’s data is safely transferred through the servers and isn’t at risk of any malicious attack. The packages come in four different sizes ranging from 5GB to 30GB disk space and 10GB to 100GB bandwidth. Add-on domains are severely restricted with a maximum of five domains allowed in the best package, making it not only unpopular among multiple website owners, but also expensive for its price tag. You can upgrade or downgrade at any time which, together with the 7-day money back guarantee, gives you some flexibility in deciding on the right package. They don’t have any discounts at the moment but do allow discount coupons. You can select monthly or yearly payment at the time of registration. Web Hosting UK has a great 24/7 online chat. A real person will be assigned to you within a minute and you can get your issues sorted out quickly. My query was answered swiftly and accurately, which is what I love about their support. Phone and email support are only available during working hours but with a great live chat system, it’s unlikely that you’ll need anything else. onClick="trackClickout('event', 'clickout', 'Vendor Page - Visit User Reviews', 'Web Hosting UK', this, true);"
We use their starter cPanel plan and had no issues. Would recommend if you're looking for an affordable and reliable web hosting provider with no downtime. 5 STARS!The features within cPanel are great as it includes everything you need to get up and running including Softaculous one click application installer. Web Hosting UK’s friendly and accurate customer support, user-friendly features, and affordable basic packages make it quite popular among bloggers. Web design services, as well as e-commerce services, make it equally popular among online business owners. If the lack of unlimited add-on domains doesn’t bother you, this is quite a decent hosting company. Wondering how Web Hosting UK stacks up against other Web Hosting companies? Enter any other Web Hosting company and we will give you a side-by-side comparison.